Bellow Hello to this Hallowed Fellow! This month your favorite astrophysicist host of Are We Alone? was awarded a fellowship with the California Academy of Arts and Sciences. 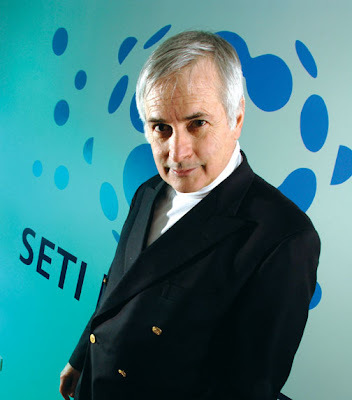 He and 11 other scientists, including SETI colleague Rocco Mancinelli, were inducted during the Fellowship's October 13th meeting. Read more about it on the Academy's press release. 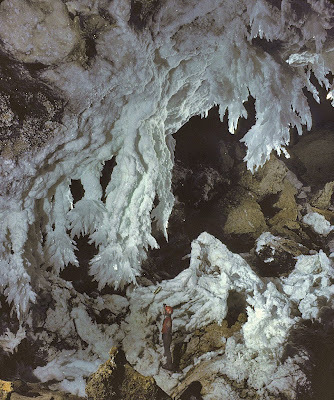 Until 1986, Lechuguilla Cave was a mere footnote in the story of Carlsbad Caverns National Park, New Mexico. After hearing air moving below rubble on the cave floor, cavers gained permission from the National Park Service to dig through the rubble, and on May 26, 1986, they literally unearthed large walking passages branching from the cave. Pictured above is a room in Lechuguilla called The Chandelier Ballroom, which features the largest known gypsum stalactites in the world. Hear more about its discovery and the exploration of Lechuguilla on this week's show, Extreme Geology. Eye of the Whale - Great read! We interviewed Douglas Carlton Abrams, author of "Eye of the Whale," for the show on communication (Say What?) and I read the book in preparation. I am a fan of science-driven Michael Crichton and Robert Preston thrillers, and this book had a similar pace. I picked it up on a Sunday, read all day, until midnight, and again the next day until I finished it. “Eye of the Whale” is both a compelling ecological story about whether humpback whale songs reveal a (frightening) truth about what we've done to our environment, and also a thriller – about a heroine who is trying to piece together the puzzle before her detractors have her silenced. And the most shocking information in the novel - about whales, endocrine disruptors, I learned from Doug, is all true (sadly). But – I have to say – it was also fun to read, the way well-written thrillers should be. I also happened to begin the book the day after seeing the film The Cove, about dolphin slaughter, which had a powerful, amplifying effect.